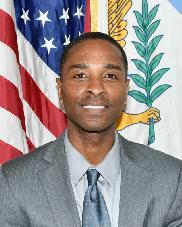 CHRISTIANSTED — Virgin Islands Attorney General Claude Walker withdrew a subpoena of the Competitive Enterprise Institute think tank that he was investigating as a part of a deeper look into what Exxon Mobil knew about climate change. Walker filed a notice of termination in the D.C. Superior Court for the subpoena for the Competitive Enterprise Institute on Friday, according to court documents. Walker filed the subpoena to try to get information about Exxon Mobil’s donations to the think tank between 1997 and 2007. However, the subpoena was criticized as an attempt to punish the think tank for holding a different view of climate change. Last week, the think tank asked the court to sanction Walker for making the case an ideological fight and not based on legal merits. Sam Kazman, general counsel for CEI, said the fight will continue. “CEI is going forward with our motion for sanctions because Walker’s withdrawal only strengthens our claim that this subpoena was a constitutional outrage from the very beginning, violating our right to free speech and our donors’ right to confidentiality, and threatening the right of all Americans to express views that go against some party line,” Kazman said. Walker joined other state attorneys general in investigating Exxon Mobil and its connection to climate science in mid-March and immediately became the most aggressive investigator. The investigation is based on media reports that Exxon Mobil learned in 1977 from a senior scientist that burning fossil fuels would warm the planet. A year later, the company began researching how carbon dioxide released from the burning of fossil fuels would affect the planet. After 10 years of exploring the problem, the company decided to “engage in a campaign of denial and disinformation,” Democratic lawmakers wrote in an October letter to the company. In 1982, the company prepared an internal document on carbon dioxide and climate change that stated “major reduction” in fossil fuel use would be needed to avoid catastrophic events. While that was circulating, Exxon Mobil didn’t tell regulators about its findings, according to the Inside Climate News report. Six years after the internal document was produced, Exxon Mobil went on the offensive, according to the report. The company began paying for efforts that would cast doubt on climate change, including founding the Global Climate Coalition. At the same time, the company was building climate change projections into the company’s future plans. Among those plans was future drilling in the Arctic because the polar ice caps would melt. Exxon Mobil has repeatedly denied the claims and has criticized the media reports, noting that Inside Climate News received funding from the Rockefeller Brothers Fund, which works against climate change. 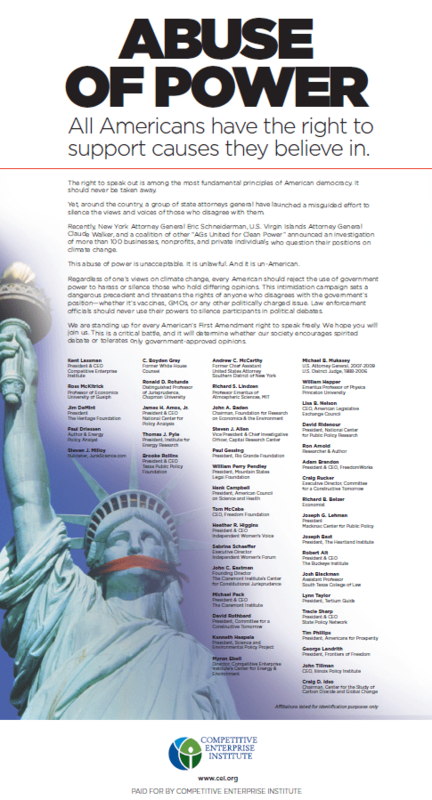 CEI Ad placed in the New York Times.